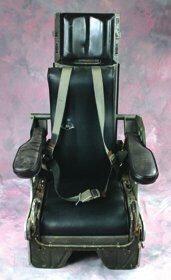 Original Spindrift pilot's chair from Land of the Giants. 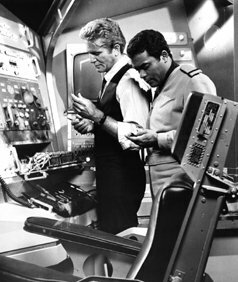 (ABC-TV, 1968-70) This pilot's chair is an actual 1960's-era ejection seat from a U.S. Air Force fighter, which has been modified with custom aluminum side accents and black leather upholstered arm rests by the studio for use on the production. 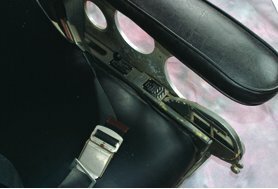 Seen in the cockpit of the Spindrift supersonic transport vehicle in many episodes of Land of the Giants. This piece was re-rented to other productions throughout the 1960's, 70's and 80's by a Hollywood prop rental house, where it was finally discovered and identified.